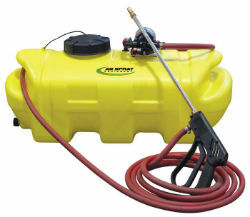 This spot sprayer is designed to handle diesel. You can leave in for days at a time without damaging seals, hose, or wand. 1.2 GPM with Viton Seals. Heavy Duty Power Cord. Deluxe Handgun. Heavy Duty Hose. Hose is Diesel & Chemical Compatible.